Are you fed up with head lice? Do you want relief from those bugs thriving and running all over your hair and scalp? Are they irritating and hurting you? Well, now you have a solution to this problem. The very simple mayonnaise could come to your rescue. This sure is too good to believe. Read on to know more about it. Mayonnaise also known as ‘mayo’ is a creamy, thick sauce that is made from emulsifying egg yolks, vegetable oil, lemon juice or vinegar and seasonings. It varies in different colors like cream, white or pale yellow. How Mayonnaise works against Head Lice? Mayonnaise contains oil and lemon juice or vinegar as major ingredients among others. Oil is effective in fighting against adult lice. On the other hand, lemon juice or vinegar works effectively against the eggs of the parasites. Oil has viscosity properties which work effectively in suffocating the live adult head lice and also the nymphs. While using mayonnaise as treatment for head lice, one must remember that it is not capable of killing the live eggs. Mayonnaise contains a large amount of oil, and it works just like any other vegetable oil, olive oil, or any other such oils. As such, it is a purely natural treatment against head lice. There is no scientific evidence as such which proves that mayonnaise is effective in treating head lice. However, a large number of people have been using this method since the last many years, and they have seen great satisfactory results. Above all, they are happy that they need not have to buy chemicals and expensive pharmaceutical products to treat head lice. An all natural way is much better than anything else. If you use low fat mayo, then it will not be as effective as you think. This is because low fat mayonnaise does not contain enough oil to be able to fight and kill head lice. When you use mayo, make sure it is the real mayo. Homemade mayonnaise or the full fat commercial ones are the best types of mayo you could use for head lice treatment. As you read earlier, lemon juice and vinegar work great against the eggs of lice. But, mayonnaise does not contain enough of them to be able to fight and kill the head lice eggs. As such, you will need to add some more lemon juice or vinegar to the mayo before you apply it on your head and scalp for treatment. When you use mayonnaise for head lice treatment, it will be possible to ensure that the adult lice and also the nymphs re all eliminated completely. Take some mayo and apply on your hair. While applying, make sure that each and every strand of hair is well covered and coated with mayonnaise. Also, remember to concentrate on the different areas like neck, scalp, and behind the ears. This controls the lice from escaping. This process suffocates the lice and does not allow them to escape by any chance. Take a shower cap and cover your head with it. In case you are using this treatment on young children, then make sure to use a safe head wrap. Let the mayo sit on your hair and settle for around 8 to 10 hours. The treatment could turn out to be a failure in case you do not leave it on for long. So, make sure to let the mayo settle for a prolonged period to get maximum benefits. Once the desired time is up, get some shampoo and wash your hair thoroughly. Ensure to get off all the oil and grease on your head and scalp to make it squeaky clean. You might be wondering why the mayonnaise treatment takes such a long time. This is due to the fact that several insects have the capacity to hold on their breath for a really long time, much longer than humans. 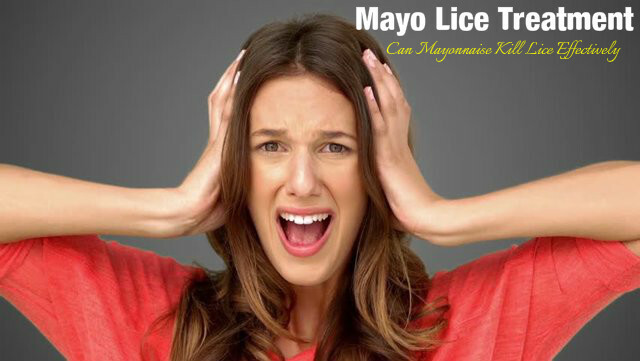 Since you want the head lice to die totally, it is necessary to let the mayo stay on for as long as possible. You could repeat this treatment after some 7 to 10 days if you feel the necessity. Ensure that you have applied a thick coat of mayonnaise. Thickness is necessary for best results. In case you are using the treatment on young children, do not leave the mayonnaise overnight. This is because they may eat the mayo. This is unsafe and could be dangerous as the mayo turns rancid within a few hours of taking it out of the refrigerator. Use a fine tooth comb to vigilantly comb your hair every day for 2 weeks. This will make sure that all nits are effectively removed. If not, then these nits could hatch and cause re-infestation of head lice on your head. Take out all the bed linens and clothes and wash them in hot water. Do the same with stuffed animals as well. This will help remove any traces of head lice or nits. Vacuum your entire house well enough to get rid of and eliminate any head lice that might be lingering around. Use the above steps properly to get rid of head lice once and for all in the most natural way possible. Once done effectively, you may not have to repeat it again. Repeat only if you see any new live ones.